SuperFogeys - Do You Enjoy Reading The SuperFogeys? Do You Enjoy Reading The SuperFogeys? Hey all, how’s it going? I’m writing this post 20 minutes before you all see the 101st strip by SuperFogeys Artist Marc Lapierre. That’s amazing. 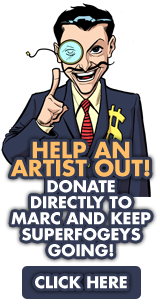 As most of you know, Marc saved SuperFogeys from certain doom after I decided to shut down the comic–and leave all storylines unfinished–about one year ago. Just to give you some perspective, imagine if SuperFogeys 300 was the very last SuperFogeys strip… ever. Everything after that? You never would have seen it. For a few weeks, that’s what I was planning. Enter Marc. Thanks to him, I was able to scale back my SuperFogeys duties to writer only AND the update schedule increased to twice a week for the regular strip. Marc saved The SuperFogeys. What’s more, he made it better. He draws stuff I never could, all while keeping the original spirit of the strip intact. He astonishes me. I think that should change. As of today, the donate button is back. But with a twist: all donations go directly to Marc. I don’t want any of it and I won’t see any of it. You’ll be making your donation directly to Marc’s Pay Pal. I know times are tough, so whatever you can do is greatly appreciated. You can donate right now by clicking on the Donate Button (sorry, can’t link to it here) in the left side bar on the site. I know I will. Thanks to all of you. Here’s to many more years of SuperFogeys to come! *It goes without saying that this donate button is not Marc’s idea. Not his style. However, you’re probably wondering how it is that I’ve never paid him for the work he does. Simple: like a lot of webcomics, SuperFogeys is not yet a moneymaking enterprise. I still hope one day it can be, but not yet. Done and done! If only it could be more…you guys would’ve been SO happy if I’d won that damn lottery. Tom, you, as always, are awesome. Thanks so much! There will be many more lotteries, yes? Sent him $10 – a nickel a strip for the first 100 and a nickel a strip for the next. “If I had a nickel for every SuperFogeys strip I’ve drawn”… well, now you do. I’m sure SF is worth $5 a year to most readers. Pony up. Haha. Nice math, Greg! Man, if everybody did that it would be tremendous. Thanks so much for your support!